People are always looking for natural ways to lose weight and boost their metabolism without extreme changes in diet or exercise. Magical weight loss pills seem to work for a while, but research usually finds harmful side effects after a few years. CLA and green tea are natural ingredients that have minimal side effects unless taken in very large amounts. Both may help your weight-loss efforts, but are more notable when combined with proper diet and exercise. CLA is also known as conjugated linoleic acid and is most often found in beef and dairy products. It is a derivative of alpha linolenic acid, which is a form of omega-3 fatty acids. Its most common uses are as cancer prevention and treatment, and weight and cholesterol control. The Memorial Sloan-Kettering Cancer Center describes CLA as an antioxidant, which helps remove cancer-causing free radicals from the body. Green tea has been used for centuries for a variety of ailments. Today it is commonly used as an antioxidant, energy booster and for weight loss. It provides positive benefits for the immune system and heart protection. Green tea contains EGCG, or epigallocatechin gallate, a polyphenol that appears to be responsible for weight loss. Most studies conducted involving weight loss with either green tea or CLA have shown positive results in people that were overweight or obese. No significant changes occur in normal-weight individuals. A study published in 2000 in the "Journal of Nutrition" compared weight loss in overweight individuals when taking a placebo versus CLA. Those taking CLA had a significant loss in body mass, while those taking the placebo did not. Another study published in 1999 in the "American Journal of Clinical Nutrition" found that green tea significantly raises thermogenic properties and fat oxidation, which increases metabolism and allows the body to burn more calories at rest. According to the "Journal of Nutrition" study, appropriate dosage of CLA for weight loss is about 3,400 mg per day. This amount of CLA can be obtained from diet alone, but it would take a large amount of calories to fulfill it, resulting in weight gain. 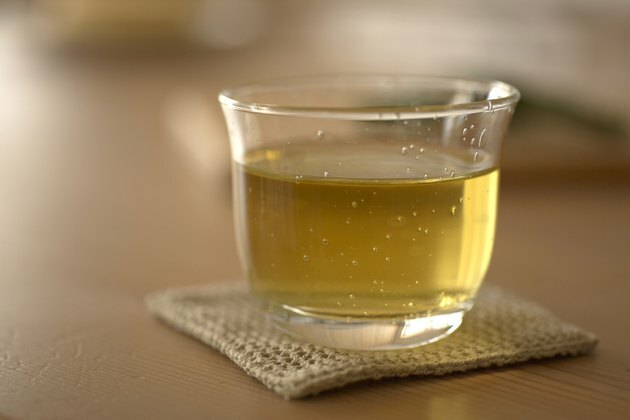 The "American Journal of Clinical Nutrition" study found that 2 to 3 cups of green tea has about 240 to 320 mg of polyphenols, and has weight loss benefits. More specifically, green tea containing 90 mg of EGCG has positive weight loss results. Rapid weight loss from CLA may cause fat accumulation in the liver, which causes insulin resistance and increases in blood sugar. This can enhance risk of type 2 diabetes, but more research needs to be conducted. Green tea contains caffeine, which can increase insulin sensitivity in people, causing drops in blood sugar, resulting in lethargy, shakiness and dizziness. People with sensitivity to caffeine should start with 1 cup per day. Green tea has been associated with lowering iron levels and anemia. Always speak to a doctor before taking any weight loss supplements.